Ruston Lodge01263 715779work01603 870304fax Self-cateringRuston Lodge, spacious and set on a family farm in Thursford, a village between the market towns of Holt and Fakenham in North Norfolk, is a good location for exploring both the lovely Thursford wood as well as the coastal towns of the areas like Wells-Next-The-Sea and Blakeney. There are numerous nature reserves not far away like Cley and further north Titchwell. • Other: Bed linen, towels, travel cot provided. Heating costs included May-Sept and £25 per week Oct-Apr, payable on booking. Spacious detached property with lawn to side and rear. 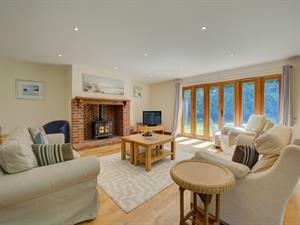 Ruston Lodge, spacious and set on a family farm in Thursford, a village between the market towns of Holt and Fakenham in North Norfolk, is a good location for exploring both the lovely Thursford wood as well as the coastal towns of the areas like Wells-Next-The-Sea and Blakeney. There are numerous nature reserves not far away like Cley and further north Titchwell.